Dockside Fresh specializes in the sourcing and sale of Scottish,Norwegian, Faroe Island and Canadian Salmon. 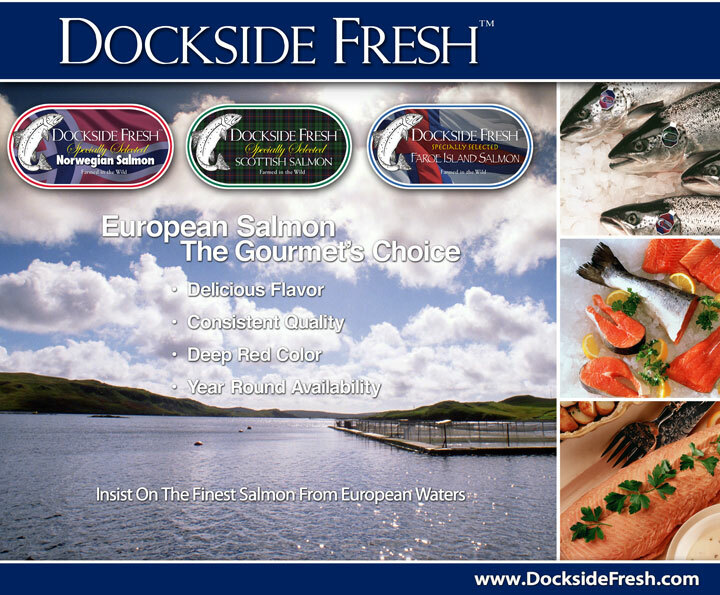 We have successfully developed the Dockside Fresh brand with our associates in both Europe and Canada. The Dockside Fresh brand is sourced directly from farms in the most remote areas of the world. The pristine waters of the North Atlantic as well as the wild storms and extreme conditions of the northern latitudes, give meaning to the term "Farmed in the Wild". Our farms use the most modern techniques available. Our Salmon is quality assured and has full traceability through the production and processing systems. The fish are harvested using well boats, which keep the fish alive until they reach the processing facility maximizing the freshness of the final delivered product. All our Salmon is fully sustainable, assuring future generations a source for this healthy protein in their diets. We are dedicated to meeting the needs of our customers with the finest quality Salmon available in the world today.